Tired of hauling vacuum systems up and down stairs and having to navigate that cumbersome canister around furniture? 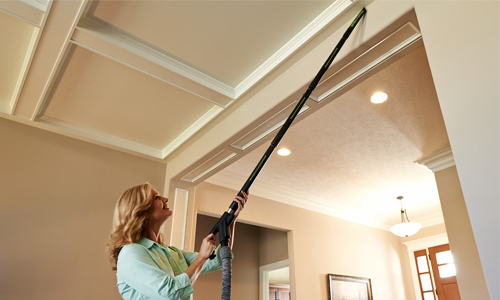 A central vacuum is lightweight, super easy to use and adds convenience. Portable vacuum cleaners make a huge racket. With a central vacuum, all you have in the room with you is the wand and hose. The motor, which is the source of noise, is centrally located in a basement or garage and therefore much quieter. Science has proven that using a central vacuum system actually alleviates allergy symptoms. Why? Portable vacuums recycle vacuumed allergens back into the air while a central vacuum system draws these allergens out of the house and exhausts them to outdoors where they belong. In addition, a central vacuum motor is more robust providing a stronger suction so you extract deep dirt. We install central vacuum systems in new and existing homes, repair and upgrade existing systems in Richmond and central Virginia. We service most brands as well as those not installed by us. Call (804) 379-1348 or contact us if you need a repair, new installation or upgrade estimate.